Back on Thursday Jan 26 we went to Magic Kingdom and EPCOT as per the post here. I wanted to add some more detail about that day. On our way out of the Magic Kingdom we decided to ride the Disney Railroad that makes a circuit around the perimeter of the magic Kingdom. This was relaxing and also gave us some nice behind the scenes views of the fairly extensive new construction going on for the new Storybook Circus area opening later this year. What was most interesting though was an announcement about halfway through the trip that we were stopping to take on water for the steam engine. I had always assumed the Disney trains were just replicas and used some alternative technologies for propulsion since they run constantly while the Parks are open. So the fact that the engines needed water was a surprise, In fact, at first I though this was just part of the show. We did in fact appear to stop and take on water, so as we were getting off the train, I asked an older cast member working at the station if it was in fact a real steam engine – the enthusiastic response was “yes it is”! They are actual restored engines from the 1920’s that Walt found on the Yucatan peninsula. We were told there are 5 engines, one of which is used for spare parts (other sources indicate the 5th engine is no longer). The engines were originally wood or coal fired but today they run on low sulfur diesel. Apparently Walt was a huge fan of the railroad industry – I was not previously fully aware of this. See this Wikipedia article for basic info and even more details and history about the railroad here. 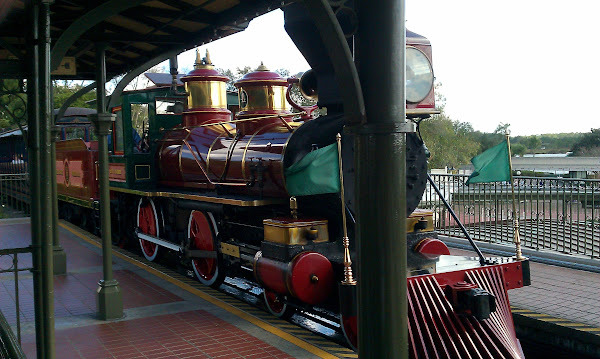 According to Wikipedia the Disney railroad represents one of the busiest steam powered railroads in the world transporting 1.5 million passengers yearly. But wait there’s more! 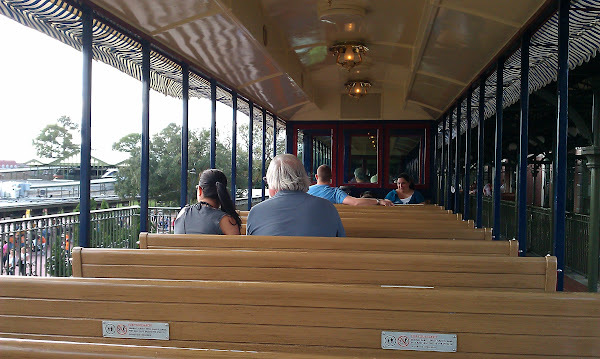 For the railroad enthusiast, Disney World in FL offers a behind the scenes tour which lets attendees get up close and personal with the trains, the technicians that work on them and the rail system including the roundhouse and other aspects not normally visible to visitors. The cost for the 3 hour tour is $49 – not bad but keep in mind you must also have park admission. The tour starts before the park opens and if it is like other behind the scenes tours we have taken it is well worth the cost. See The Magic Behind Our Steam Trains Tour for more info. Wow! I want to go on the Steam Engine Tour. You can tell us all about it when we see you next month.